For several reasons we designed our bikes to be motor-assisted at the front wheel, as opposed to the rear wheel or at the crank. One reason is better weight distribution. With a rear mounted battery (or seat-tube mounted one for that matter), having the motor on the front wheel helps make the bike feel more stable…not only when you are riding it, but also when you are walking it along. 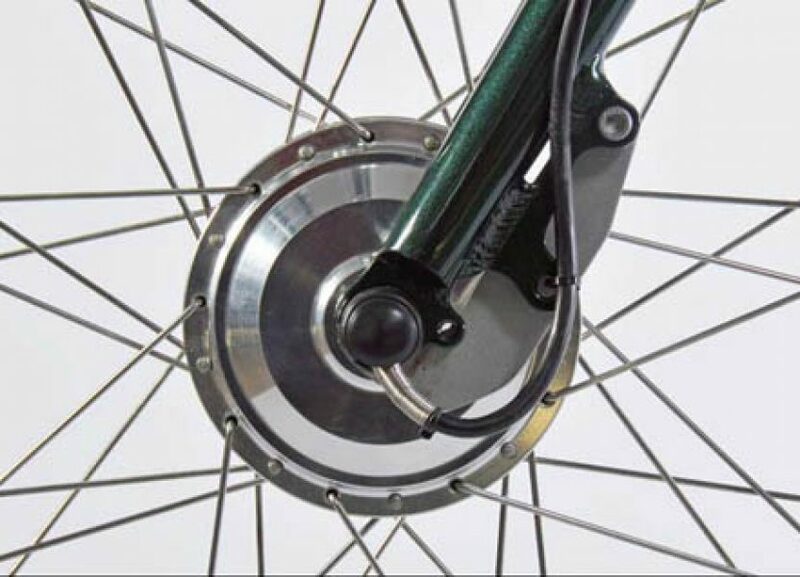 Another benefit is that a front wheel motor allows us to use an internally geared hub in place of a derailleur on the rear wheel. A third reason (and this one is not very commonly known, in fact I have never heard or seen anyone else talk about it) is that it enables much enhanced stability, particularly when negotiating soft or loose ground. On very soft ground the stabilizing effect of small bursts of power from the throttle is quite amazing. This stability stems from the fact that a motor- driven front wheel always “pulls” in the direction it is pointing, whereas, when driven by force from a rear wheel (as in conventional bike or rear wheel drive electric) “steering” the front wheel to maintain balance can cause it to “plow” sideways instead of rolling in the direction it is pointed. If you have experienced the difference between pushing a heavy wheelbarrow over soft ground vs pulling it, then you have experienced a similar difference (albeit stemming from a slightly different fundamental mechanism). With judicious use of the throttle a rider can literally “float” his bike over loose ground (sand, snow, mud). Not for everyone. But it sure is fun!